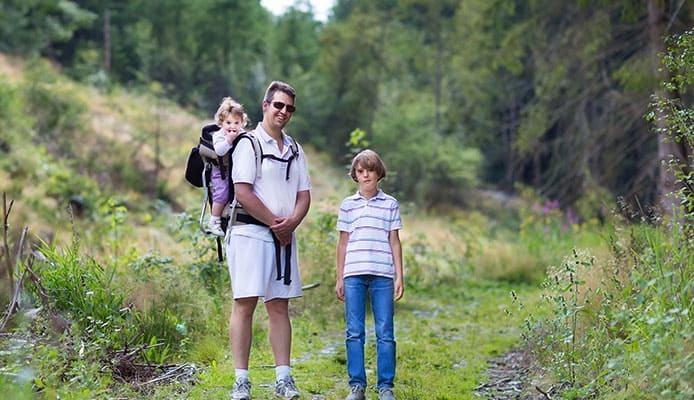 It can sometimes feel with a baby as though you are confined to only being able to do a certain number of activities, but by getting the best hiking baby carrier you are able to introduce them to the beauty of nature. 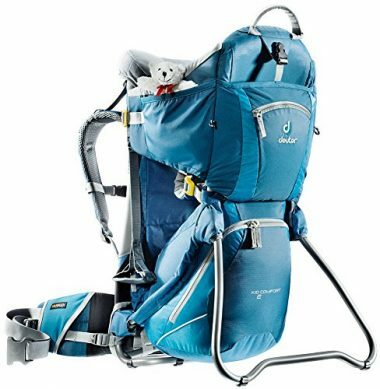 Choosing the best baby carrier for hiking can be difficult though as it requires the right level of support and choosing the right features too. Here in this guide we will talk through all of the important features so you can be confident in choosing the perfect carrier for you. 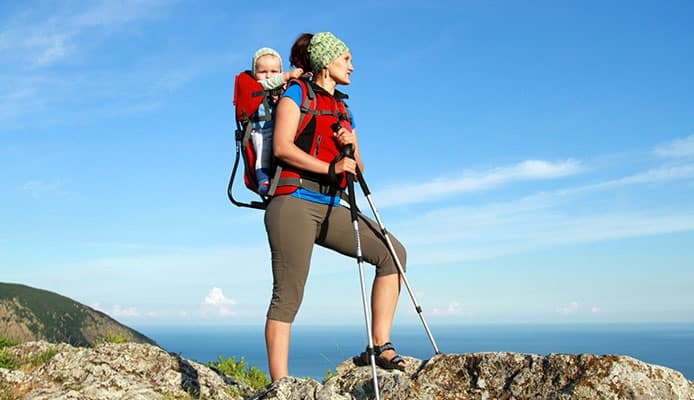 We have also created hiking baby carrier reviews on the top ten products on the market to give you the best choice in order to start your hiking adventure with your beautiful baby. 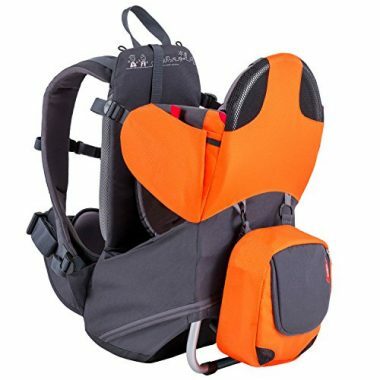 This is a top rated baby carrier for hiking as it has all the features that you’d expect from a hiking child carrier. It has an aluminum frame to support the baby and their weight, with straps that will make it highly adjustable to you. The child seat is fully padded and the carrier features a sunshade too to ensure that your child is fully protected at all times. 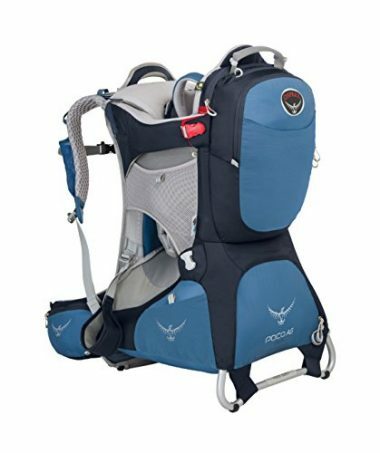 This is a brilliant hiking backpack baby carrier from Luvdbaby which will be able to fully support your baby with its padding, and features an aluminum frame which you can fold out when you need to set the carrier down. The carrier is highly adjustable to make sure it’s comfortable and comes with pockets for all the essentials and even a diaper pad for then you need to change them. 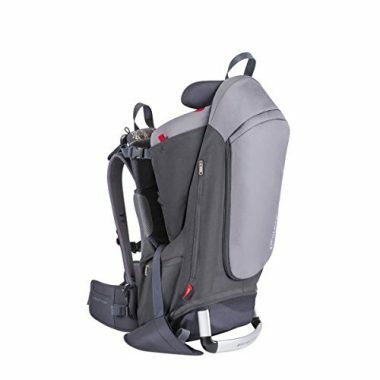 This backpack baby carrier from Clever Cross comes with an aluminum frame for all the support you need and adjustable foot straps too, which are a vital feature. There are plenty of pocket options for your baby’s needs but also to store valuables too. It has energy-absorbing lumbar padding in order to keep you comfortable for a long time. If you have a 2-4 year old, sometimes all they want to do is walk, until they get too tired. 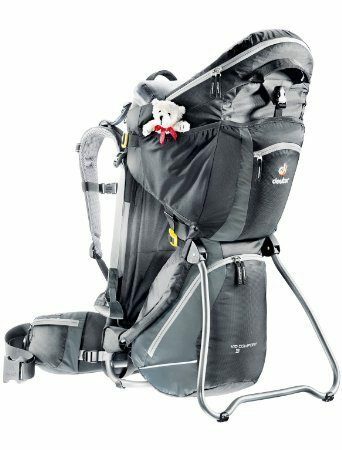 This is a great toddler carrier for hiking for those who like to venture out but you still have the safety of having a harness. That harness can unclip when you’re child wants to be on the move again. The product is light and portable and gives plenty of support to your back. Deuter have produced a highly-rated baby carrier which has a padded 5-point safety harness and padding to ensure they stay safe at all times. 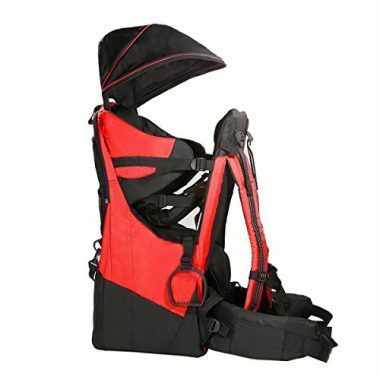 The carrier has a lot of ventilation in order for you and your baby to stay cool. The carrier is also fully adjustable and had an aluminum frame which can be set down to be used as a chair when you need a break. This is another version of the Deuter chair and another one which comes highly rated. It weighs slightly less than the previous model but with that comes slightly less storage space. It will still be able to offer that brilliant support and padding though and is a carrier which is going to be comfortable for both you and your baby. This is another brilliant hiking backpack for baby and is very lightweight as it weighs just five pounds. That low weight though does mean that it doesn’t have the weight support of others as this is suitable for children up to 33 pounds. It does though have plenty of support, including lumbar padding, and plenty of storage options for you and your baby. This is a much more compact carrier and weighs just 4.4 pounds with a maximum child weight of 40 pounds. The internal aluminum frame will allow it to be free standing while the padded back will contour to your spine to ensure it stays comfortable. It’s highly adjustable and will be perfect for your hiking adventures. This is another great product from phil&teds which is also compact but able to have a lot more storage than the previous model. That storage comes with an increased weight of 6.6 pounds which is still light when compared to others. That storage includes a hydration pouch which will be very useful. 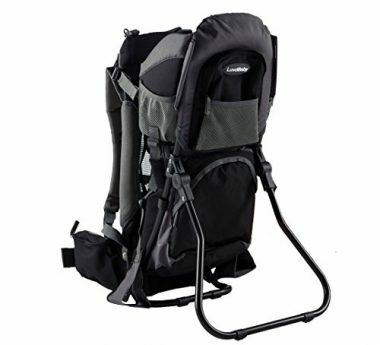 The carrier is heavily padded and gives a lot of lumbar support. This child carrier does a brilliant job at distributing weight to ensure that there are no uncomfortable pressure points for you or your baby. It comes with a vast range of storage options so you can take everything with you and the strong aluminum frame will keep everything sturdy and allow you to place down the bag with ease. It’s important that you choose a safety harness which is able to keep your child secure at all times. Trips and falls can happen when you’re hiking and they have to be protected. The harness should be able to give your child the same level of protection that they would have in a car seat, otherwise you risk them not being safe enough when they are in the seat. You need support and padding all around the carrier. The two most important places are the sides of your child to protect them from impact and the support that you are going to have for your back. Your child will also need plenty of padding on their seat and all the straps will need to be as comfortable as possible too in order to carry the weight. Being able to set your child down when you take off the carrier is important as it will mean that they have a place to sit and you don’t have to worry about taking them out of their harness every time you stop. Some carriers are able to do this with their standard frame whereas others will have a kickstand which can be folded out in order to make a solid base for your child. The weather has always been, and will always be, notoriously unpredictable. If you are caught out in the rain then it’s important that the carrier isn’t going to get too wet and water resistance is a great feature. You also want protection if it’s too hot as well and the carrier having plenty of ventilation in order to prevent you and your child sweating is key to a comfortable hike. The importance of this depends on when and where you will be hiking but if you’re going to be on roads or crossing roads, then having reflectors on the carrier can be important to immediately let anyone know that you are there. If these aren’t featured on your favorite carrier then it’s a good idea to buy them separately and stick them on. A mirror can be a very useful addition to a carrier but it’s not absolutely vital. Just as if you needed to check on your baby in a car, a mirror will allow you to see if those funny noises that they make are something cute or if it’s something that needs checking out. A mirror will save you from having to stop and take off your backpack. Due to the large amount of weight that can be in a carrier, the normal construction of something like a backpack wouldn’t be good enough. It needs to have a strong frame in order to be able to cope with the weight and give you the support required to have a comfortable hike. These are usually made out of aluminum which will give you that strength but without too much weight. As you’ll well know, babies require a lot of things when they are out and about whether that is simply their food, their favorite toy or everything you need for a happy change. Having enough pockets for these items is vital as it will prevent you from having to carry an additional bag. You need to make sure your carrier has enough storage for your needs. On such a heavy item, having conveniently placed grab handles is a good idea as it will allow you to maneuver the bag in a safe and comfortable way. Hooks are a good feature to have for your child as it will allow you to keep for child entertained if they start to get a little bored and a security point to stop anything from going missing. Babies need protection from both the sun and the rain, everyone knows that but sometimes it can be tricky to carry everything you need. Having a carrier with a built-in shade is going to be very convenient in order to keep your child protected if you are out in the hot sun or if you end up getting caught in the rain. You want to ensure that you are getting a quality product in order to make sure that your carrier can last for a long time. A lot of these products will be able to hold a child for their first four years or more and you want it to be able to last at least that long. Getting a product which is highly rated and seeing user reviews from those who have had the product a while is a great way to test this. Getting a lighter product can be useful but you have to take it in the context of the situation too. There is little point in worrying about an extra pound of carrier weight when you are going to be carrying a 30-pound baby, for example. You also want to check the weight limit of the bag to ensure that you are going to be supported. You are able to get softer baby carriers which are suitable for small children but these naturally can only be used for a short period of time as they will have a low weight limit. Getting a carrier with a frame will mean that you are able to use the product for years rather than months. Q: When To Use A Hiking Baby Carries? A: Most baby carriers recommend using their carriers from around six months up, as then the baby is strong enough to be able to comfortably sit in one. If you are going to be doing any significant amount of walking then they can be very useful, even for those children who are competent walkers. They are also a fantastic item for those dangerous situations such as crossing a road or going over difficult terrain, when you can concentrate on safety without having to worry about anything else. Q: How To Wear A Carrier? A: Baby carriers can hold a significant amount of weight and therefore are able to produce a significant amount of momentum, which can cause you to lose balance. In order to reduce that you need to ensure that it is strapped close to your body and held tightly against you. The largest portion of the weight should be taken on the waist strap which will be over your hip bone and all the straps should be held tight, but not too tight that it’s restrictive. You should start with the shoulder straps, then move onto the wrist strap before eventually securing it with the chest strap. 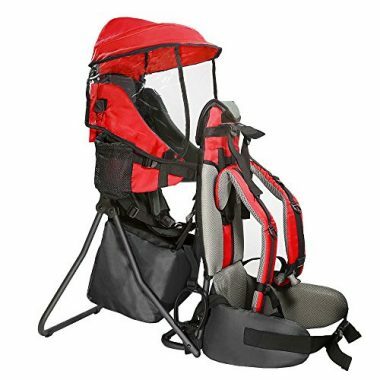 Q: What Are The Safety Requirements For A Baby Hiking Carrier? A: As with any hike, you want to ensure that you are fully fed and watered before starting out and make sure that you take enough food with you. It’s not ideal you’re your baby to feed while you have the carrier on your back, so having breaks are ideal. It’s an obvious point but you need to ensure that your child is protected from any direct sunlight when it’s hot and any water when it’s raining. Having a shade is essential but also items like a cooling spray can be very useful too. As with all child safety, it’s simply about common sense and making sure they are fully strapped in. 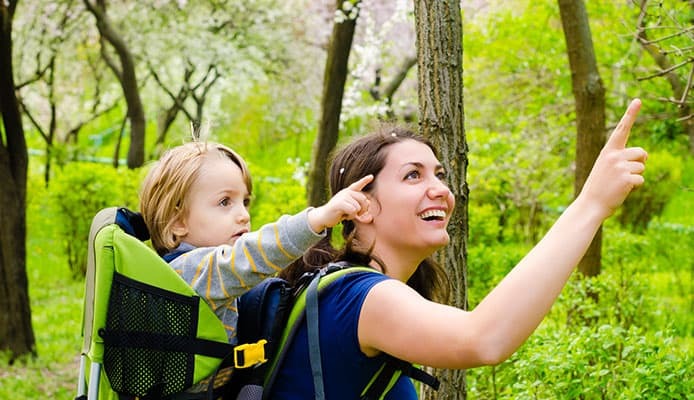 Your hiking adventures don’t have to stop when you have a baby and these carriers are brilliant at being about to get you out and about and able let your child share in your enjoyment and introduce them to the beauty of nature. As will any child product, you want to ensure that they are safe and healthy and getting a carrier with the right harness and the right level of padding is very important. The biggest function that these carriers need to have after your child’s safety is their ability to support the large amount of weight that will be placed in them when compared to regular backpacking. 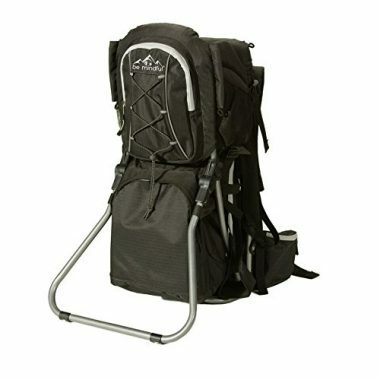 Having a carrier with a strong frame with is able to evenly distribute the weight is an essential element to you being able to have a comfortable hike. After that, there are other important features too such as your ability to set down the carrier on the floor, the number of storage options that it has and also the additional safety features that it will have. You want to make sure that you have a quality product which will keep you and your child happy. Once you have made sure your chosen product has all the required features then you would be able to start to enjoy your new hiking adventures with your baby. Hopefully this guide has given you all you need to pick the perfect carrier for you to be able to hike with comfort and safety.